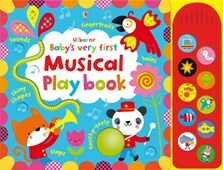 A wonderful, colourful, musical touchy-feely book that will delight babies of all ages. A range of gentle musical sounds relate to the simple pictures on each page. Babies will love the touchy-feely patches of the jungle, under the sea and outer space. Delightful to share, this book will engage even a tiny baby's attention and as babies grow they will love to press the sound buttons themselves. This series is designed to be used from birth, with low-decibel sounds and high-contrast pictures. Featuring original music from Anthony Marks. With buttons producing sounds, finger trails using cut-outs and textures, holes for tiny fingers to explore, flaps, fabrics and other materials, this book encapsulates many of the principles of The Science Museum’s Sensory Garden in a bright and accessible volume.